We recently picked up some small paper bowls at our local dollar store to use for crafting. 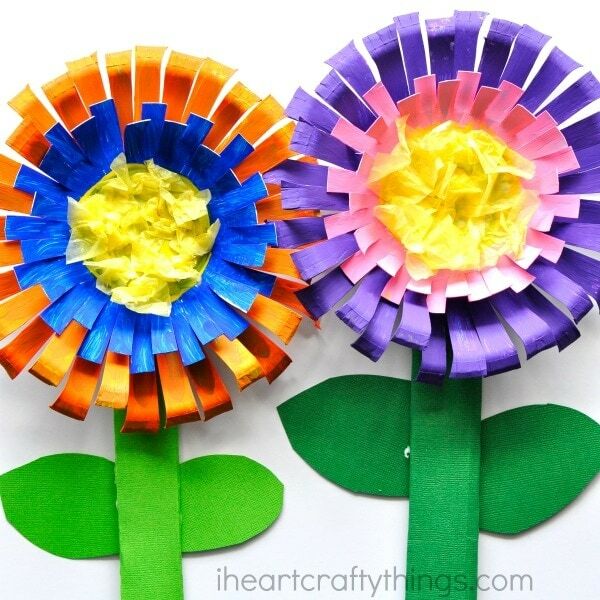 We’ve already enjoyed making jellyfish and ladybugs, but while I was staring at the flower design on the plates I realized they would work perfectly for creating a bright and colorful flower craft for kids, and the craft would make excellent scissor cutting practice for my preschooler. 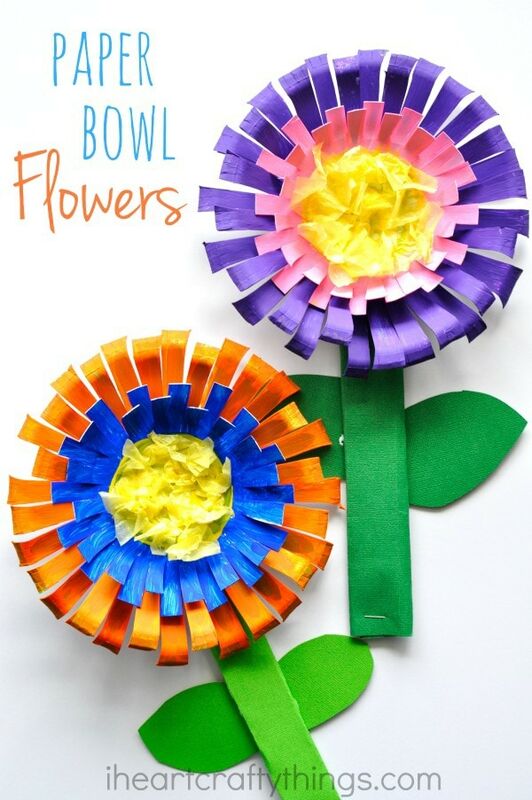 So we set to work and creating these amazing paper bowl flowers. They are absolutely stunning hanging up on our craft wall. I don’t think I ever want to take them down. 1. 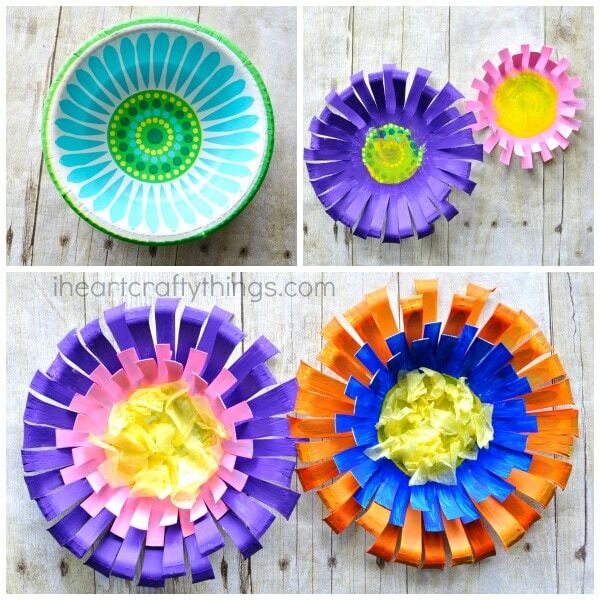 Start by using your scissors to make slits all around two paper bowls to make flower petals. 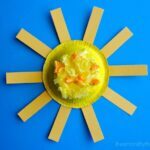 Our paper bowls had a flower imprint inside them so this made it extra convenient for my preschooler. If you don’t have those lines, don’t fret. Just let your preschooler make slits around the bowl however they choose. Since we wanted a layered effect for our flowers, we trimmed down the petals on one of the plates to make them smaller. 2. 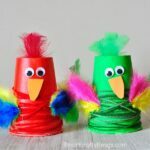 Paint your paper bowls with acrylic paint. We painted the inside of the flowers yellow but if you are using the tissue paper this isn’t necessary because the yellow paint will get covered up. 3. Once your paper bowls have dried, glue the two bowls together. Then glue crinkled yellow tissue paper squares on the inside of the flowers. 4. Now it’s time to make your flower stem. Since the flower craft has a little bit of weight to it, you’ll want to fold a piece of cardstock paper into thirds and staple it shut. This adds some extra sturdiness so you can hold your flowers by the stem. 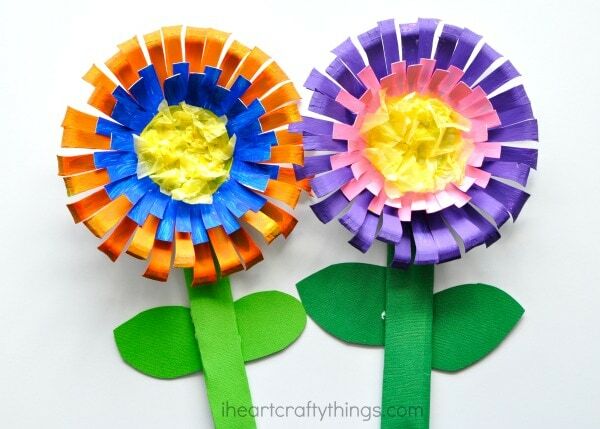 Glue or staple the stem to your paper bowl flower craft. 5. 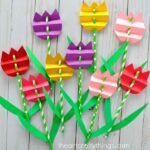 Finish your flower craft by cutting out leaves from your green cardstock paper and gluing them onto the back of your stem. Aren’t they gorgeous?!! Make sure to work your way around the bowl, bending the petals up and down to really make the flower pop with dimension and color.